While the search for understanding can be traced back to the ancient greeks, the modern take on sense making has a history of it’s own. Dervin (1983, 1992, 1996), and Russell, et al (1993, 2009) – on the human-computer interface, with the earliest explorations on the psychology of recognition and understanding. Klein, et al (2006) – studying frame-to-data, and data-to-frame matching as a means to test patterns observed, advancing the earlier work of Cohen, et al (1996) and Piaget (1972,1977). Snowden, et al. (2003, 2007) – with the “Cynefin” framework, introduced complex and chaotic scenarios, in contrast with the simple, the merely complicated, and the hopelessly disordered; with this more robust landscape, real world situations were more accessible, or at least visible. How have these understandings evolved? Has sense making come of age? Q1. HCI as Foundation. Was the early research important to what came after? Q2. Klein and Pattern Matching. How influential have patterns become re: sense making & complexity? Are we returning to foundations? Q3. Weick on Narrative. Has story consumed our dialog in the modern framing of sense making? For better or worse? Q4. Snowden & Complexity. How has Cynefin changed the sense making dialog? Q5. Futures. What is the path to practical application for sense making? Our back story? The #orgdna chat community has been meeting since late 2012 on topics from leadership to learning, most often focused on the social dynamic. To what end? Making sense of it all, of course. This topic is right up our alley. Our conversations are typically lively. Just add #orgdna to your tweets at the appointed hour. We recommend a streaming app like TweetDeck. After the conversation, we’ll share a PDF transcript. And there’s likely to be a follow-up chat on a related thread. We do this every 3rd Monday, 9pET/6pPT. Props to group member Christy Petit, who helped me shape this conversation. Intrigued? I certainly am. The rest is up to the group. Hope to see you online Monday night. When we talk about team play or collaboration, we often talk about the importance of establishing common ground. Trouble is, we spend very few cycles on how to get there. From the literary side of the world there’s a valuable and relevant tool called Metaphor that links abstract notions to concrete things we can observe .. Since the dawn of civilization, we’ve used Story to pass down values and create emotional connections across societies and generations .. So what does all that mean for us as collaborators? What if we were to weave metaphor and story together to form a new, more resilient way to get people working together, stitching a durable fabric of ideas and communication principles that everyone can relate to? Well, actually, we just did. Reread that last sentence. The weaver and fabric metaphors are themselves powerful because they elicit the sense of creating something strong, new and valuable. Putting ourselves .. as collaborators .. into that metaphor is the stuff that draws interest and connection, and the short narratives wrapping around it all quickly evolve into emotional, high impact stories. When our communication is rich and insightful and touches on our emotions, I’m finding that fundamentally deeper connections can be forged. All of the sudden, collaboration is not only possible, it’s contagious. Let’s unpack a few aspects of how these fascinating communication tools can help us. Q1. Semantic Grounding. From Aristotle to Lakoff much has been said re: the power of metaphor to make the abstract more clear; what are your favorite examples? Q2. K12 Education. How does the factory metaphor for learning (re: defects) stack up against a more organic metaphor, like the rhizome (re: rooted resilience)? Q3. Emergence. In “Where Good Ideas Come From” @StevenBJohnson shares Reef, City & Web as 3 metaphors for emergence. Other examples? Something based on weaver or grower idea: maybe Fabric? or Seedling? Q4. E20 Storytelling. How can simple narratives tell a story? If we put our enterprise co-workers and stakeholders in the plot and discuss consequences, can we touch emotions? I hope you’ll join us SAT 8/18 at 11aET as we discuss what I always find a fascinating topic. If you want to dig further, you’ll find discussion of both threads in The DNA of Collaboration, now on Kindle, with softcover launch planned for Labor Day. In the book, I discuss over 20 metaphors (including all of these) which can, when used in stories and even simple narratives, provide rich and powerful ways to establish common ground. In truth, language and communication are vast topics, and we are only scratching the surface .. But as they say, you have to start somewhere. See you online? More and more we’re called upon to collaborate – but the factors that determine our success can be elusive. Collaboration requires focus, intention, time and engagement, key elements that are far too scarce in the 21st Century. Collaboration is a choice. And it’s a choice many will avoid. The world isn’t waiting for us. The pressure is on. We must find ways to unlock the potential of our organizations, many of them gridlocked by the structural hierarchies left over from the century-old Industrial Revolution. Collaboration is not easy. But it promises deep rewards for those who invest time in getting it right. 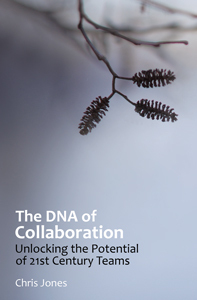 The DNA of Collaboration is a practical guide for teams who intend to do better. And it’s not just a book, it’s conversation. Keep an eye on hashtag #cdna as we begin to unpack the core topics online. Follow us on Twitter: @collabdna (book) and @sourcepov (author).